In their 2014 book, “Abundance: The Future Is Better Than You Think,” Peter Diamandis and Steven Kotler posit that the adoption of hydroponics on “one square New York block… could feed fifty thousand people a year. One hundred fifty vertical farms could feed everyone in New York City.” Though a hydroponics-packed New York exists purely in theory, the benefits of hydroponics in agriculture cannot be understated. In a world increasingly plagued by water and food scarcity, hydroponics is an attractive, and growing approach. Free Salad is one small part of this growth. They are a recently formed student organization at the University of Wisconsin-Madison dedicated to embracing and spreading the hydroponics movement. Lucas Peterson, the organization’s co-founder, shared his dream of a hydroponics-driven future: “Every home could have the technology and knowhow to sustainably grow some of its own food supply." For those uninitiated, hydroponics is an alternative method of agricultural production that doesn’t rely on soil, and can be done in confined spaces indoors. Hydroponics systems facilitate plant growth through a constant flow of nutrient-infused water. Plants are commonly suspended in a trough with their roots reaching down into the water flow, gathering as many nutrients as needed. Meanwhile, natural sunlight is replaced by LED lighting. The water flow system is what makes a hydroponics project so efficient and effective when compared to traditional soil farming. Chief among its benefits is the constant recycling of the nutrient water throughout the system. Because of this, farming with hydroponics results in 99% less water use than its soil counterpart. Additionally, there’s no fertilizer runoff, representing a tangible improvement over soil farming in regards to the health of waterways. Peterson and his two co-founders, in collaboration with roughly a dozen other students, are working to spread awareness of hydroponics’ potential through a variety of community education and outreach projects, as well as the development of their own on-campus hydroponics farm. 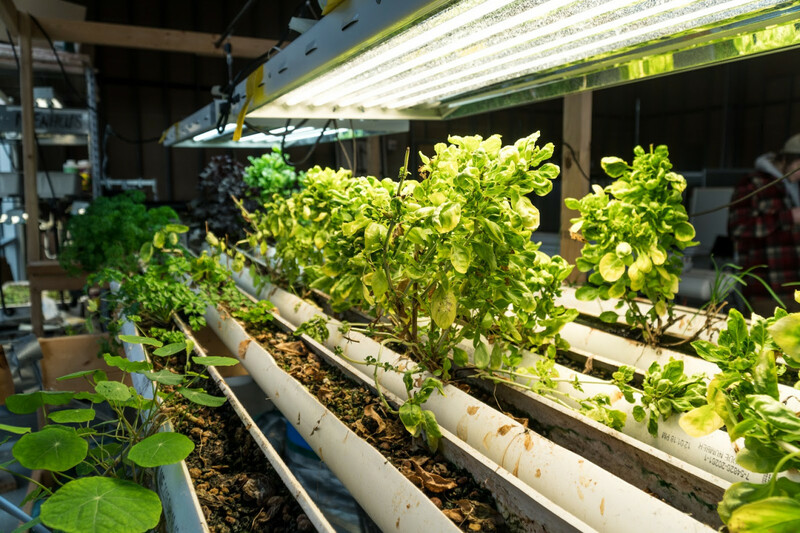 Tucked away in a storage area of a campus-associated building, Free Salad builds, tests and modifies a range of hydroponics systems. After only two months of development, the current efficiency and size of Free Salad’s farm is only a fraction of the group’s long term goals, but the results are already tangible. Using only donated supplies and a little DIY construction, the team has created a functioning farm, and is growing real produce. Free Salad will soon begin construction on a second story in their tower garden setup. This style, referred to as vertical farming, capitalizes on the small footprint of hydroponics systems, maximizing the growing potential of limited spaces. Once completed, the addition will double the system’s total yield. “Hydroponics is much more accessible today than the average person realizes,” Peterson said. He estimated the total cost of the tower garden pictured at roughly $100, including the water pump at the heart of the fixture. As a part of their community outreach plan, Free Salad will be distributing tomato plant seedlings in miniaturized hydroponics systems at a community event. Peterson and the rest of the group believe that direct public exposure like this will achieve two of their primary goals: broadly increasing awareness of hydroponics itself, and increasing food access. Free Salad also has plans to work with local schools, introducing hydroponics systems into classrooms and educating younger students about its applications in agriculture. Free Salad’s education and outreach efforts come at a critical time, with Dane County’s Department of Public Health reporting that 11.8% of people, and 17.5% of children in the county face food insecurity. Peterson and others share the belief that hydroponics seems poised to be an answer, or at the very least a part of the solution to pervasive issues like food deserts and insecurity. The U.S. Department of Agriculture defines food deserts as areas that lack access to affordable foods that make up a full and healthy diet. This issue disproportionately affects low-income and minority areas where grocery stores are replaced with fast food and convenience stores offering only primarily sugar-filled, processed foods. Hydroponics seems poised to be an answer, or at the very least a part of the solution to pervasive issues like food deserts and insecurity. While also affecting rural areas, food deserts are especially troublesome in urban areas, where population density is greater. Free Salad is looking to raise awareness and contribute to the eradication of the more than five local food deserts in the greater Madison area. This issue is not unique to Madison either, affecting 23.5 million Americans in total as of 2010, many of them residing in urban areas like Chicago, New Orleans, San Francisco, Atlanta, and other populous urban areas, according to the USDA. Hydroponics is not without its obstacles and drawbacks. Peterson was frank that the future of the technology is highly dependent on a widespread shift to renewable energy sources. The energy costs for large scale growth can be enormous, especially for certain crops like corn and tomatoes. This makes hydroponics operations difficult to scale, and renders their environmental benefit questionable in areas without access to renewable energy. “The biggest barrier to hydroponics being mainstream is a lack of public awareness,” Peterson said. This is why he believes so strongly in the work that Free Salad, and other groups like it, are doing. Growing the hydroponics movement, inspiring others to embrace the technology and help its spread, this is the ultimate goal of Free Salad, Peterson explained. Despite these challenges, Peterson is unwavering in his dream of hydroponics’ future: everyday people approaching their local administration for change, creating their own organizations to continue learning, or simply experimenting with growing. He believes that with efforts like Free Salad’s around the country and globe an inflection point could occur, and a widespread embrace of local foods and sustainable, accessible eating could be on the horizon.